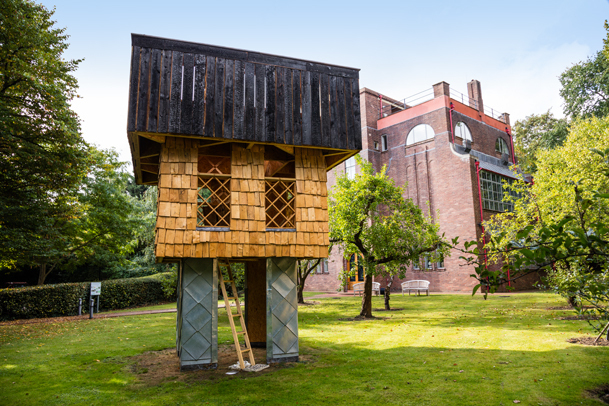 As part of Kingston University Degree Show 2016, Unit 5 of the School of Architecture and Landscape Design have designed a new pavilion for the museum’s garden. 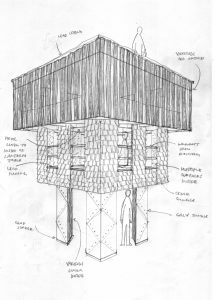 Unit 5 continue the 1:1 construction project work established by tutors Takeshi Hayatsu and Simon Jones during their teaching of studio 3.2*, with another pavilion in the garden of Dorich House Museum. This structure is derived from a multitude of precedents and inspirations encountered during our study trip to Nagano and Tokyo. from a 16th century timber castle, to a self-built concrete house, our itinerary was arranged with the assistance of Professor Terunobu Fujimori whom we visited in Japan, and subsequently was invited to Kingston for a series of talks and workshops in March this year with the generous support of the Diawa Foundation. The Museum hosted a symposium on 18 March, ‘Japanese Avant-garde’ red school ‘and UK contemporary crafts’ to introduce the project and explore its themes with Professor Fujimori, architect Adam Caruso and design historian Tanya Harrod. “Red school” is the term coined by Fujimori to describe a group of Japanese architects whose works are characterised with the aspects of handmade and deep sensual and tactile qualities of their buildings. The family tree of the ‘red school’ can be traced back to the Takamasa Yoshizaka’s Inter University Seminar House project of 1965, which the students are interpreting for their pavilion project. 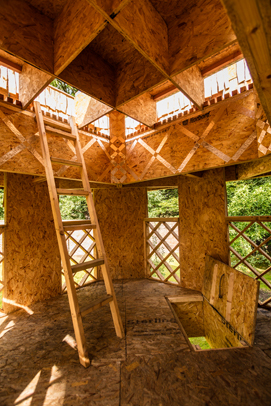 The structure itself is formed of three layers, each clad in different materials, Zinc, around one thousand shingles made from sweet chestnut logs, and on the final layer Yakisugi or Shou-Sugi-Ban, which literally translates as burnt cedar wood, commonly used in Japan for siding and decking projects. 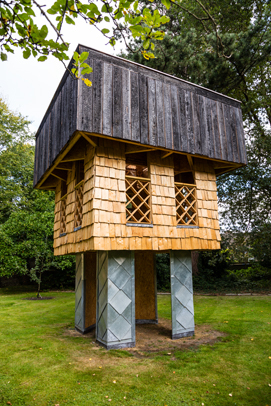 Visitors are able to explore the inside of the structure by climbing the ladder, enjoying the view of Dorich House Museum and Richmond Park through the windows or sitting at the table on the top layer. The pavilion will remain open to the public during museum opening hours (Thursday-Saturday 11-5) from Saturday 4th June – Saturday 30th July and as part of the London Festival of Architecture.